« This is National Travel and Tourism Week! International Pow Wow Showcases the USA – And We Are HERE! It is a sea of business being done – they say more than $3.5 billion in sales will be closed here by the 5500 buyers and sellers gathered here. It is a sea of foreign languages – over 70 countries represented here. 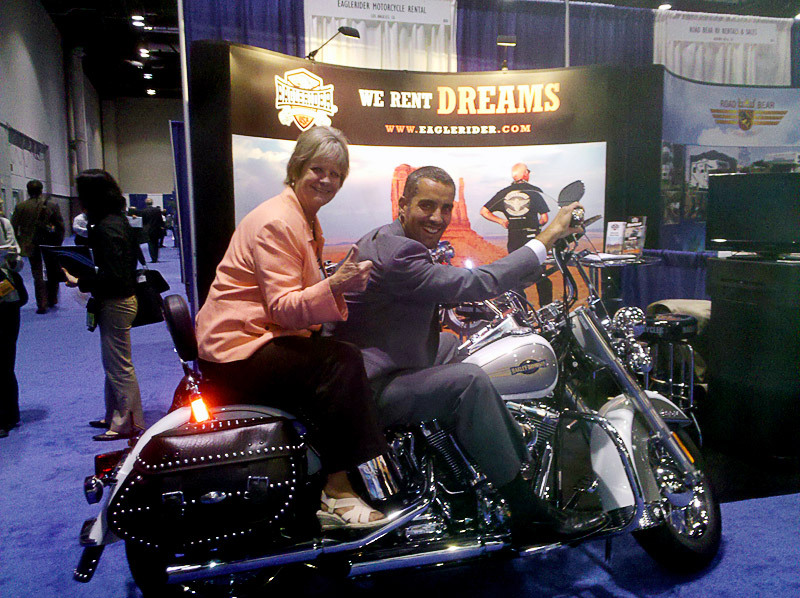 It is a sea of colorful exhibits throughout the trade show floor – showcasing the offerings of 1,100 exhibitors from hoteliers to transportation companies, including Harley Davidson, to destinations and more! It is the best of all chances to network and further the face-to-face relationships so critical in creating travel opportunities for international consumers – thus the concept of a pow wow. Where in the world is Helen Marano today?? I am working the exhibit floor of the US Travel Association’s International Pow Wow 2010, the 42nd of these shows, in Orlando, Florida. Pow Wow is designed to sell the United States as the premier global destination. As director of OTTI in the International Trade Administration at the U.S. Department of Commerce, it is a critical venue for me to connect with my (world)wide client base. It is also important to be here as the U.S. Department of Commerce started this show with the travel industry in 1967! It is a part of our history. More importantly, you can see the business being done to expand travel and tourism – the top services sector export for this nation. Last year alone, travel and tourism generated $121 billion in revenues for the U.S., creating a $21 billion trade surplus! Over 1.2 million American jobs were supported by these revenues. This is where we can see the President’s National Export Initiative in action! This is the core of business being done for future years’ travelers. The top tour operators and agents are here creating packages and deals for their customers. And the American businesses are proudly exhibiting their wares to encourage those deals. When they send travelers to the United States to spend money here by staying in hotels, visiting attractions, renting cars and flying U.S. carriers to get here or to other parts of the country, shopping, dining out, taking in a musical or visiting a museum, it is counted as an export on the country’s balance sheet. After all, you can’t ship the USA over to them! So the money spent here – the receipts – on their experience of visiting America is an export, accounting for 24% of all services exports and 8% of the total exports for the country. No wonder Deputy Assistant Secretary of Services, Joel Secundy, decided to make the trip to Orlando – to meet the delegates and experience first-hand the business being conducted. No wonder the Under Secretary of the International Trade Administration, Francisco Sánchez, is on his way to deliver the keynote speech for the closing luncheon (May 19). He will physically view the sea of delegates to be thanked for all they do in delivering this valuable export, and to recognize their important role in making the National Export Initiative a success! It is a sea of industry professionals who put the “Wow” in Pow Wow and DOC is right here in the thick of it all!